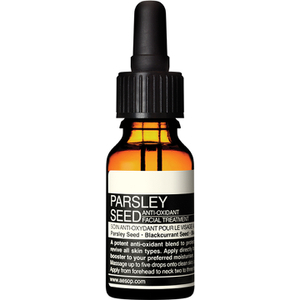 Revitalise your complexion with the Parsley Seed Anti-Oxidant Facial Treatment from Aesop. Suitable for all skin types, the fast-absorbing oil works to hydrate, protect and replenish skin to leave it radiant and healthy-looking. 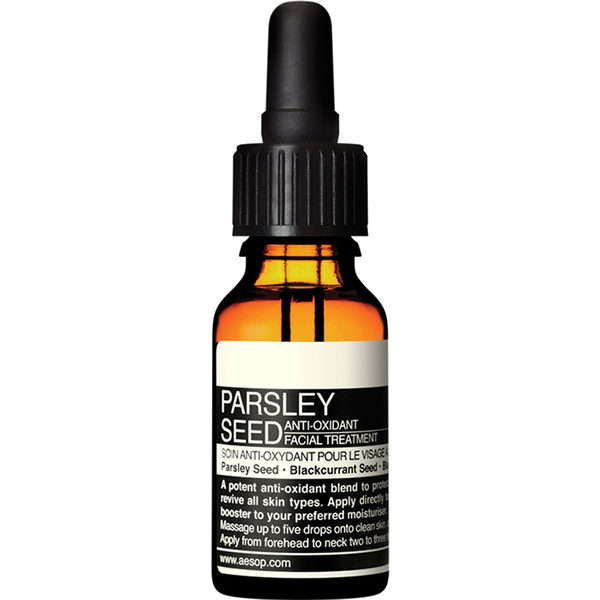 Fortified with nine antioxidant-rich ingredients and fatty acids, including Parsley Seed, Blackcurrant Seed, Evening Primrose Oil and Sweet Almond Oil, the weekly booster helps to fight free radical damage and environmental aggressors that can lead to signs of ageing. Complete with a pipette for mess-free application, you can expect a smooth, supple complexion with a subtle herbaceous aroma. Three times weekly, massage three to five drops into cleansed and toned skin. Alternatively, blend nightly with your preferred Aesop hydrator to intensify hydration. Good. Feels safe to put it on my face and it does not make my skin greasy.